Ocean View Drive is a good opportunity for some less trafficked, open road running atop the bluff in Wellfleet. The road goes for a little over 3 miles, from Lecount Hollow Rd. to Newcomb Hollow Beach. One is fairly high, above the water. There are ocean views, some of the way, and a couple of lookouts. The views along part of the road are blocked by shrubbery. Note there is no sidewalk/shoulder, so use caution and run opposite traffic. A good shorter option is to run the 1.8 miles from Lecount Hollow Rd. to the Beachcomber at Cahoon Hollow Rd. One can do a loop, involving one of the roads leading to Ocean View Dr., such as Cahoon Hollow Rd. or Long Pond Rd., which go by ponds. Note, however that they are mainly wooded, and narrow with no shoulder. Note: this road is open and it can be hot, and there are no facilities in the area. 3.3 miles one-way from Lecount Hollow Rd. 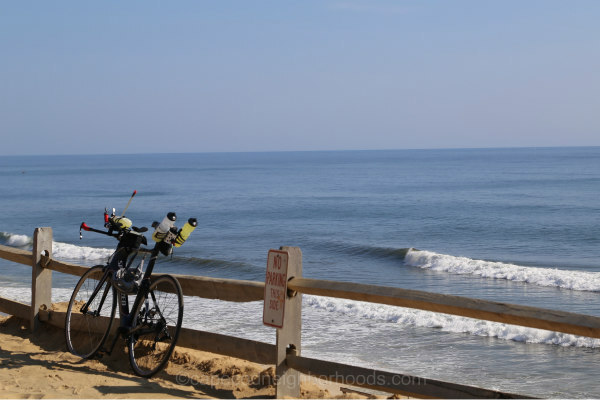 to Newcomb Hollow Beach; Shorter option is 1.8 miles to the Beachcomber at Cahoon Hollow Rd. Parking might be limited along Ocean View Dr.